Detect Mycoplasma in cell culture with the e-Myco Valid kit. All the components arrive in a vacuum dried Premix tube. This helps to avoid hydration and oxidation. All you need to do is add your sample. 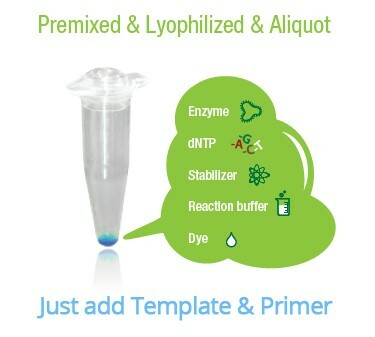 This kit allows you detect 70 species with the sensitivity of 10 CFU/ml. Mycoplasma is a genus of bacteria which lack a cell wall. Without a cell wall, they are unaffected by penicillin or other antibiotics that target cell wall synthesis. Physically very small (< 1 micron), Mycoplasma are difficult to detect with a conventional microscope or neutralize with common antibiotics. As a result these robust bugs are often found in research laboratories as contaminants in cell culture. Reports indicate that 1/3 or more of all cell cultures are contaminated. Unfortunately, such contamination may induce cellular changes, including chromosome aberrations, changes in metabolism and cell growth. Moreover, severe Mycoplasma infections may destroy a cell line. Testing for mycoplasma is an essential quality control tool to assure accurate research and reliable biotech products. Try the e-Myco KIT. Detect Mycoplasma in cell culture. All the components arrive in a vacuum dried Premix tube. This helps to avoid hydration and oxidation. All you need to do is add your sample. This kit allows you detect 49 species with the sensitivity of 20 CFU/ml.